Well, the title of the page is slightly misleading, because I currently don’t have any black roses. I stole it from a Dungeons & Dragons novel because I liked it (I liked the novel too, in its day; I still have it on the shelf). I’ve always been rather fascinated by ‘black’ flowers. 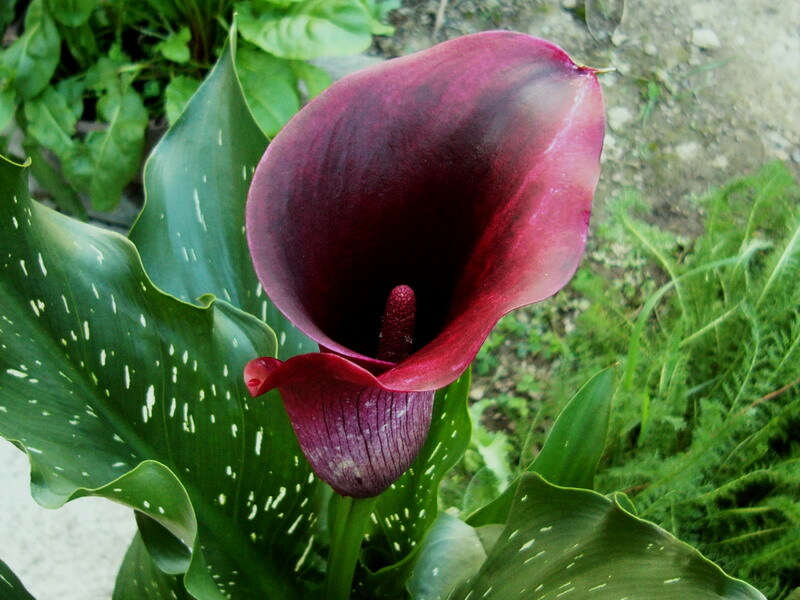 Of course, I know there are few if any truly black flowers out there; those called black are always a very dark shade of some other colour, usually purple or red. Furthermore, the depth or intensity of the colour can often by affected by local conditions, particularly temperature and sunlight. Still, over the years plant breeders have had some success with developing ‘black’ flowers, and I’ve been lucky enough to obtain some of them. I usually prefer to garden with native plants (at least for ornamentals) but I make exceptions for very dark-blooming ones. In general, I don’t bother with annuals or biennials, but again, I make exceptions for very dark blooms. Even so I don’t usually bother to have them more than a couple years unless they self-seed and the seeds survive local winters (hardy annuals, in other words). 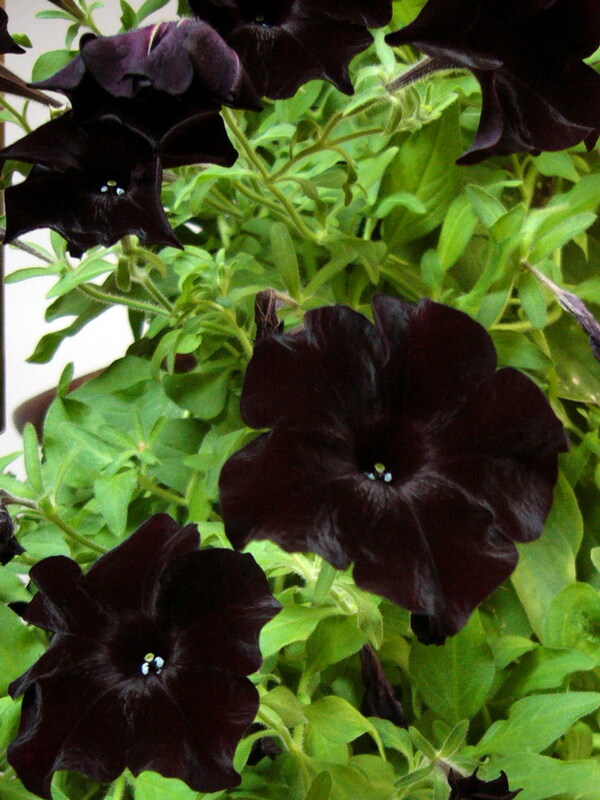 One year I got ‘Black Ray’ petunias. I grew them in containers, and even managed to keep a couple of them going for almost an extra year by bringing them indoors for winter. They had some trouble acclimating to the lower light, but once they did, they performed just as well as they had outside. 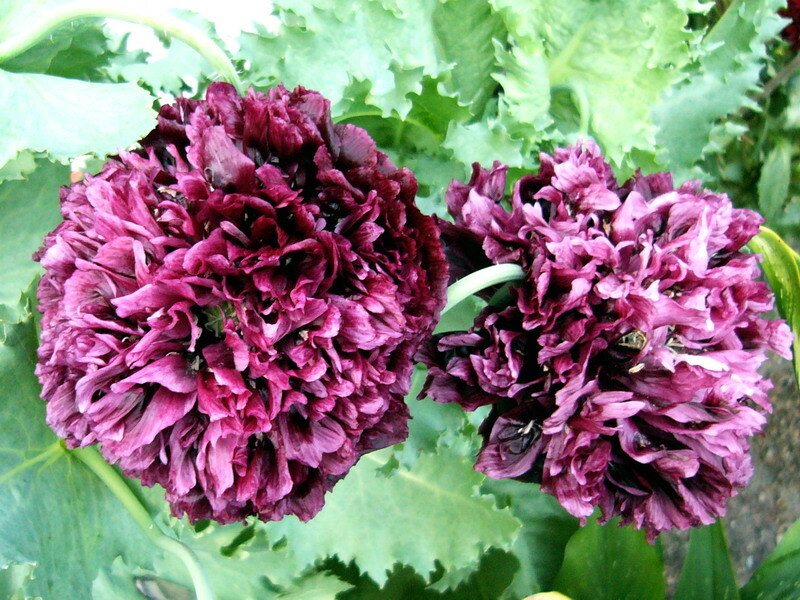 Last year (2014) I ordered seeds for ‘Black Peony’ poppies (Papaver somniferum), another annual. These were disappointing; the ones I had were a much brighter purple than the very dark blooms I’d seen in pictures. I did collect some seed from them and will resow them again this year to see what happens, although I doubt things will be any better. 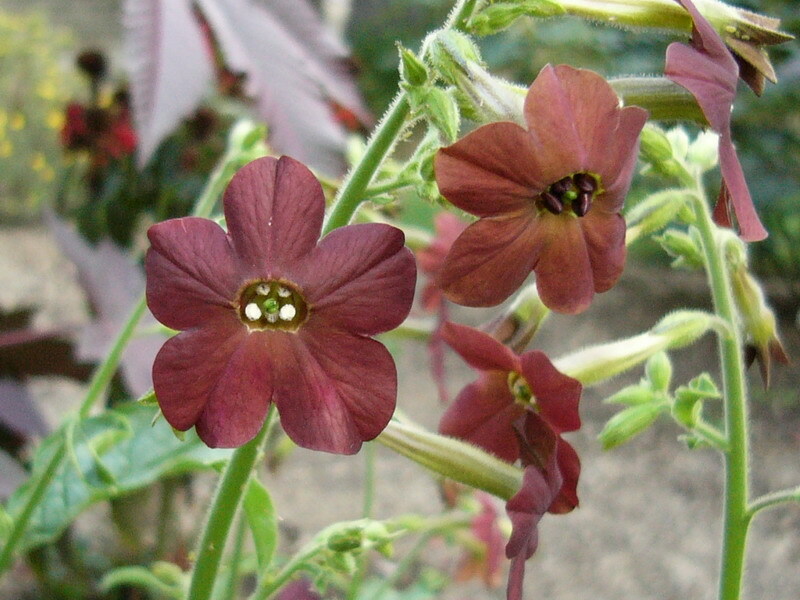 Also in 2014 I ordered some nicotiana ‘Chocolate Smoke’ from the same source. These too were less dark than the pictures suggested, but I wasn’t unhappy at all. The flowers were supposed to be a very dark purplish-brown, but mine came up lighter: more of a dried blood sort of colour. I thought this was even more interesting. While on the annual/biennial topic, I’ll mention that I’ve never grown black hollyhocks (Alcea rosea ‘Nigra’) and have no intention of ever trying. While the flowers are extremely dark and enchanting, and very popular, I simply don’t find hollyhocks in general to be worth the bother. As biennials, you have to wait a year for them to flower and then they die, so propagating them is tedious (though not difficult). They grow tall and often floppy, and in my area we can get some pretty high winds, so each plant needs to be staked. Finally, hollyhocks are very susceptible to a fungal disease called rust (Puccinia malvacearum), which also attacks other plants in the same family…such as my marsh mallow (Althaea officinalis) and swamp rose mallow (Hibiscus moscheutos). In theory it would be nice to have; in practice: no. I had a ‘Black Baccara’ rose once. Being a hybrid tea rose, it was fussy and temperamental and it didn’t survive its first winter. I was a nice rose, deep red, and it gets touted as being the darkest red rose available. Roses are a definite example of how weather and climate can affect bloom colour, and the few blooms I got were nowhere near as dark as they ought to have been. I sometimes wonder if I’ll ever try it again, but I doubt it. Aside from the aforementioned fussiness of hybrid tea roses, the ‘Burgundy Iceberg’ floribunda rose (you can see it on the Rose Garden page) satisfies. ‘Queen of the Night’ tulips! These never disappoint: the flowers are always a lustrous deep silky purple. People always complain their tulips don’t survive or spread from year to year, but I can’t get mine to stop spreading. 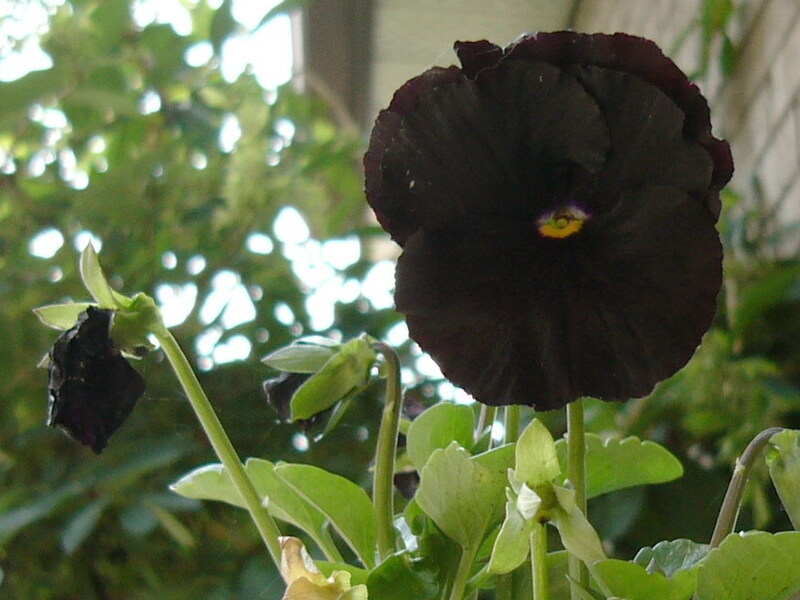 These have always been the mainstay of my black flower collection. Unfortunately I have no pictures of mine to share, but they’re easy to find online. I do, however, have a picture of another, similar, tulip called ‘Paul Scherer’, which I planted in fall 2015. Ironically I took a picture of it this year, but didn’t take any of the ‘Queen of the Night’. Honestly, however, I can’t say I see much of a difference between them; the ‘Paul Scherer’ opened maybe a day earlier and the flowers are ever so slightly more slender, but that’s about all I can tell. ‘Schwartzwalder’ calla lilies (Zantedeschia) were yet another disappointment (I believe schwartzwalder means black forest). 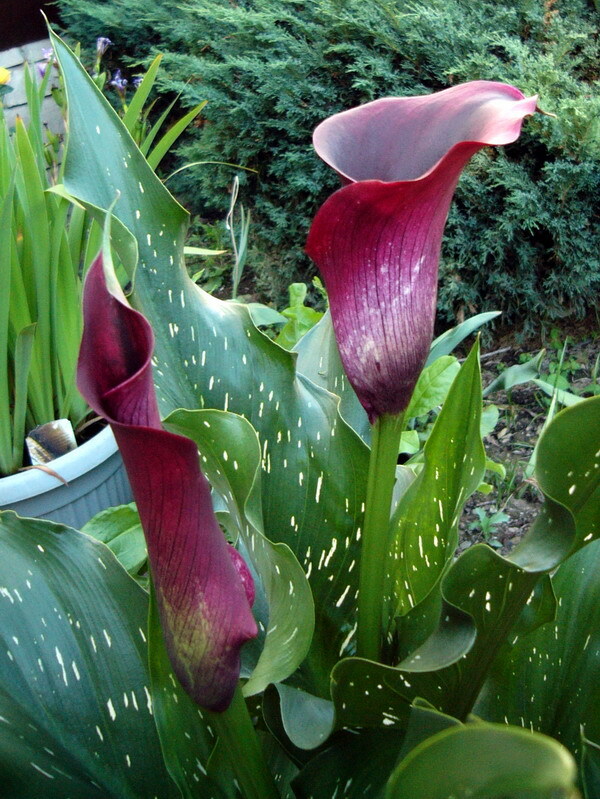 The picture on the label showed a practically black flower (technically it’s a spathe); the blooms I get are consistently burgundy each year (see them below). Ironically it’s a very attractive shade of burgundy and I get a lot of compliments about them…which actually irritates me more than it should. Don’t shop at Wal-Mart, kids. Castor beans (Ricinus communis) are tropical evergreens; here they’re grown as annuals. I like the ‘New Zealand Purple’ cultivar for its foliage rather than flower colour; the little flowers are bright red while the leaves and stems are dark purple-brown. They get pretty large over the course of a single season and I originally got them to fill in an empty space. Now that space is no longer empty, so I don’t know if I’ll grow them again. Placed in the front yard they were definitely eye-catching. 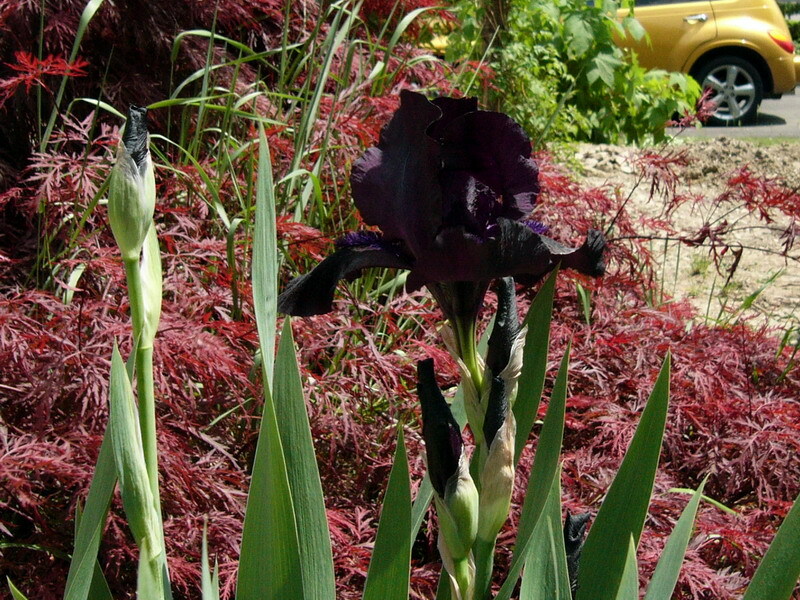 In summer 2014 I bought a ‘Hello Darkness’ iris (Iris germanica). Again, according to the label and pictures I’ve seen in books and online, the bloom is almost black. 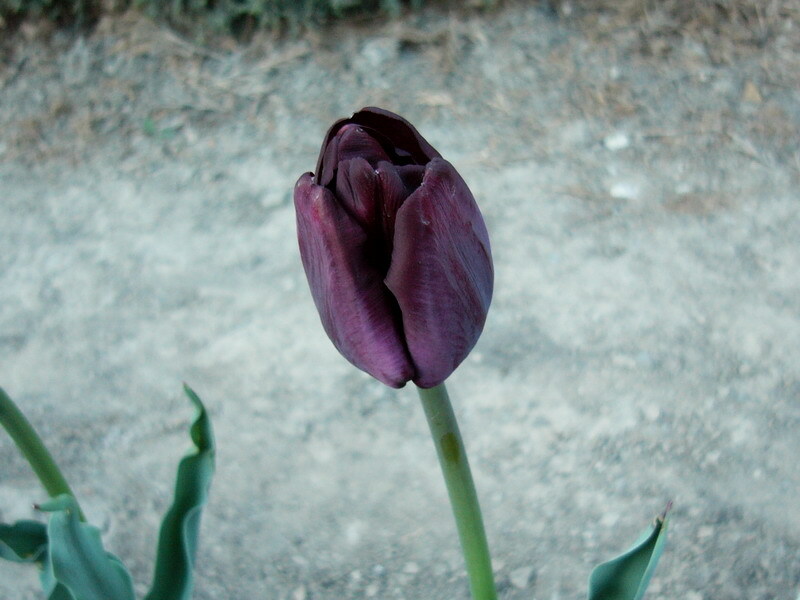 I was thrilled when it flowered in May 2015 and the bloom was indeed extremely dark. As the individual flowers age, they lighten to a gorgeous, rich shade of deep purple. They didn’t last long, but it was well worth the wait. 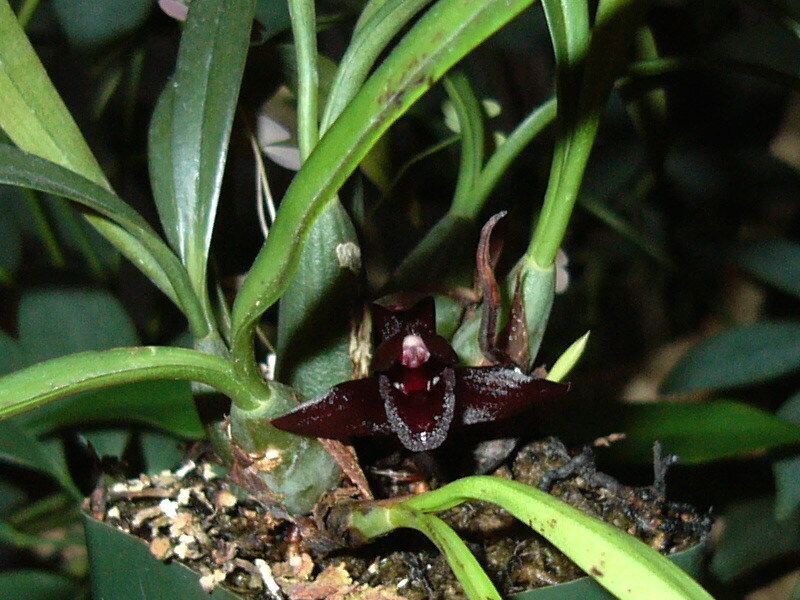 On February 14th 2015 I got my hands on “the black orchid”, Maxillaria schunkeana. I think its common name is Schunke’s maxillaria, but this isn’t any more helpful than the botanical Latin name (in fact, that’s what it means). 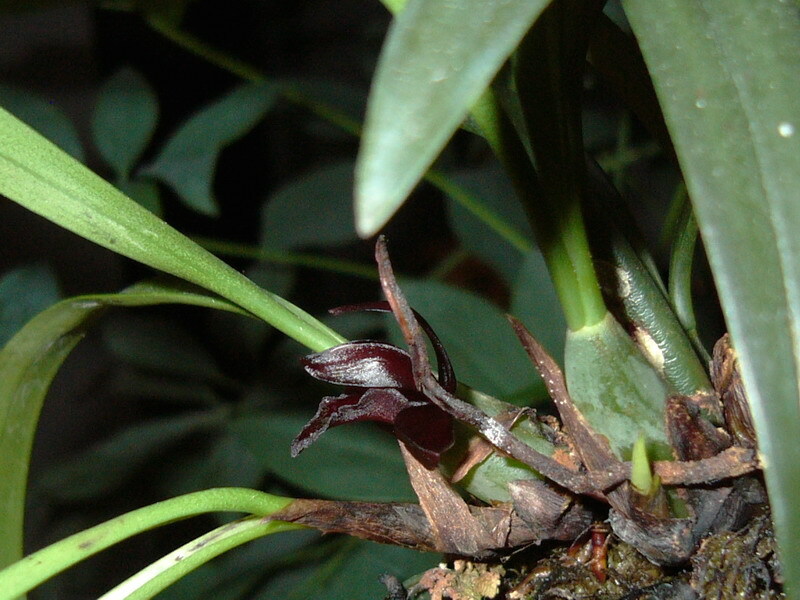 This is a small tropical orchid native to Brazil; it naturally has flowers so deep red they look almost black. Yet another houseplant to add to my already overcrowded house. But holy crap I feel warm and fuzzy inside when I look at it. Caring for tropical orchids in a Canadian house in winter poses some challenges that I never found worth the bother, but for this one I made an exception. It first flowered in November when I least expected it; I just looked at it one day and there it was. That really made my day. 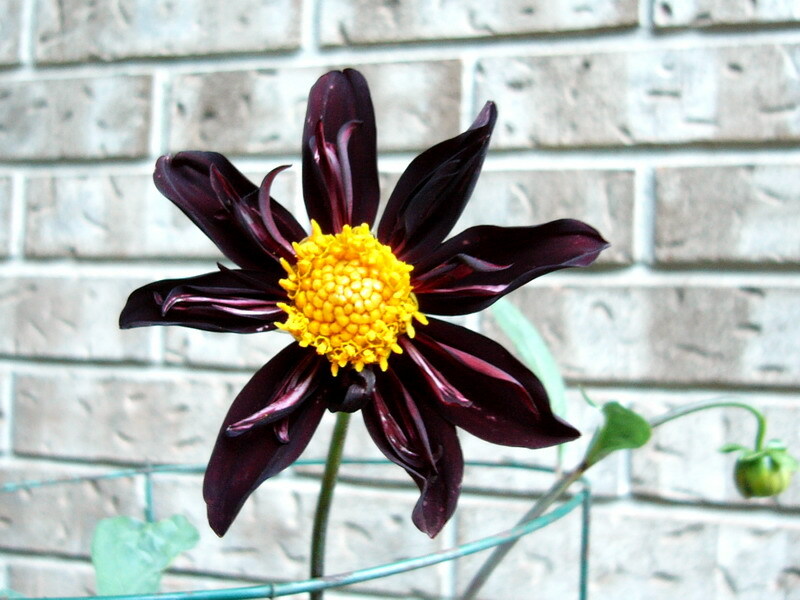 In spring 2015, I got a ‘Karma Chocolate’ dahlia. It was on discount and free shipping to boot, and I was intrigued by pictures of them. When it got here, it was a single tuber and I thought it would take years of nurturing it before it would bloom. Boy I was wrong. It’s blooming like mad and the first flush at least are pretty large. I’ve often been disappointed by supposedly dark flowers, and these do brighten in shade (a deep red) as the flower ages, but I’m pretty happy with this one. The one in the picture below was actually darker at the time; ironically now that it’s opened fully, the colour is closer to that in the picture. 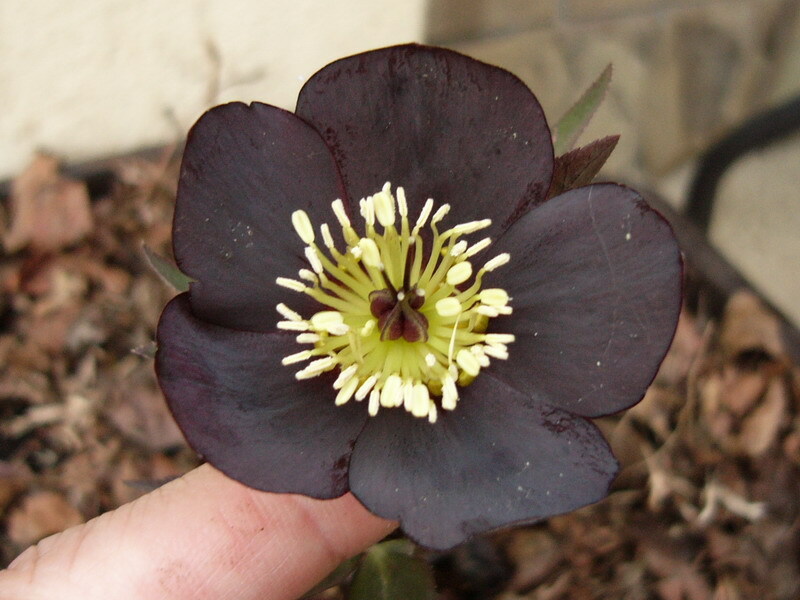 In 2015 I got a Hellebore ‘Winter Dreams Black’; it arrived after flowering (as I knew it would), but after planting it bloomed again. The flowers were a sort of washed-out greyish purple, but hey, I couldn’t complain. This year (2016) the early spring bloom suffered a bit from the up-and-down weather we had, but one flower survived and the colour is, in a word, stunning. When this plant clumps up and start flowering in bulk (it takes a few years for hellebores), it’s going to look spectacular. Below is a picture of it. The only shame is that hellebore flowers nod and bend over so you have to lift them up to see them. 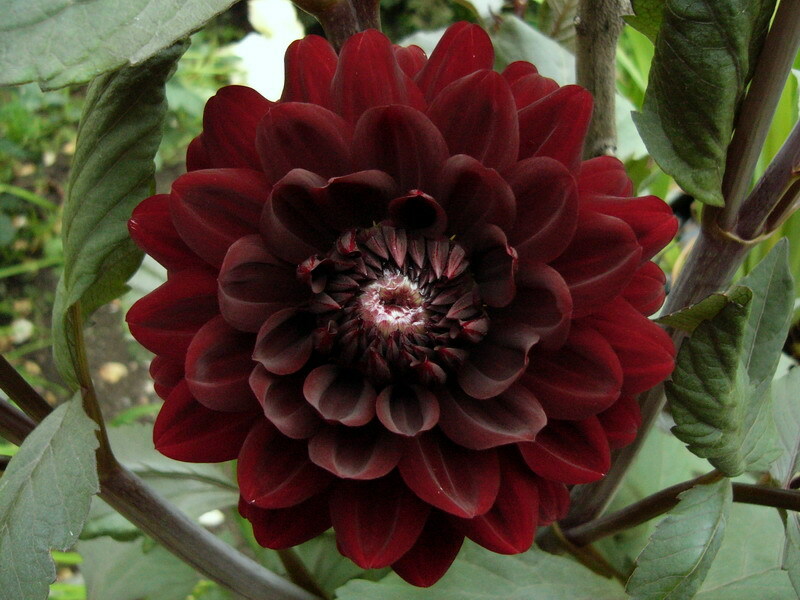 This year (2016) I got a new dahlia: ‘Verrone’s Obsidian’. It’s the new black dahlia! The outer petals are deep deep purple, and there’s a small inner ring of petals that are much lighter, which sets off the dark ones. I might wish it were one of the more petal-heavy types, but it’s stunning nevertheless. The Iris chrysographes I bought last year bloomed this year (2017). This species naturally has extremely dark purple flowers, with a gold mark on the falls (hence the specific name: chrysographes = gold marking). 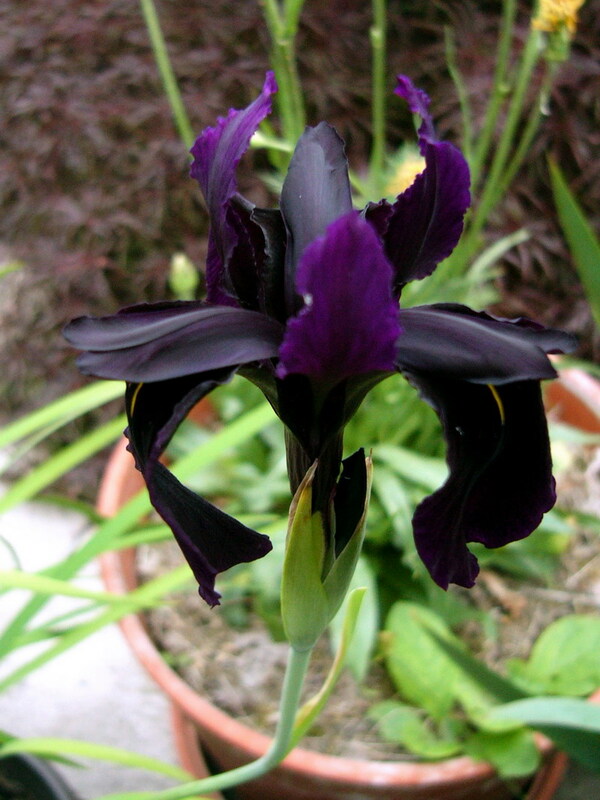 It is often used in iris hybrids to impart that lovely, almost-black colour to the flowers. The flower is actually a little darker than it looks in the picture. The ‘Black King’ pansy I started from seed (2017) has bloomed. 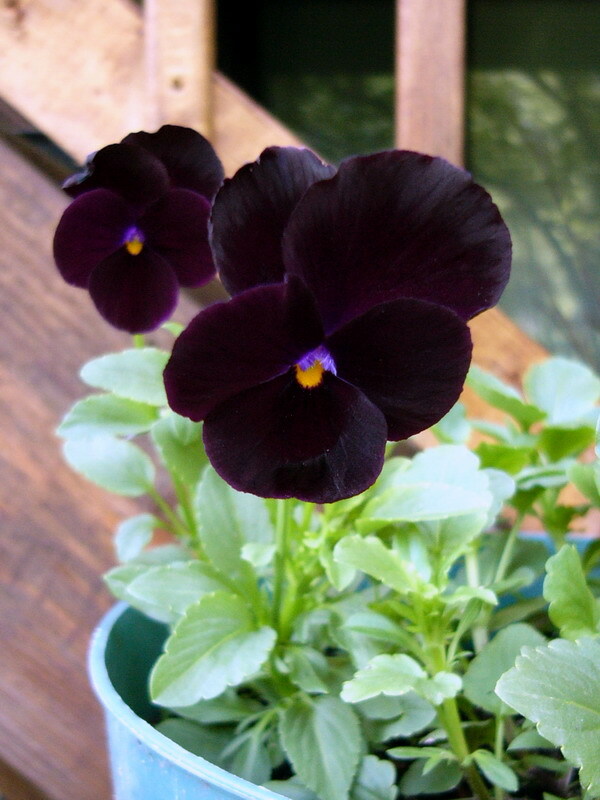 It’s not quite as dark or as large as the ‘Black Moon’ pansies I grew a few years ago and can’t get any more (why, whyyyyyy won’t you sell in Canada anymore, T&M?). It’s still very nice though, and I hope I can get them to overwinter this time.